This is the first in a series of reports highlighting findings from the 2014 U.S. Religious Landscape Study, the centerpiece of which is a nationally representative telephone survey of 35,071 adults. This is the second time the Pew Research Center has conducted a Religious Landscape Study. The first was conducted in 2007, also with a telephone survey of more than 35,000 Americans. 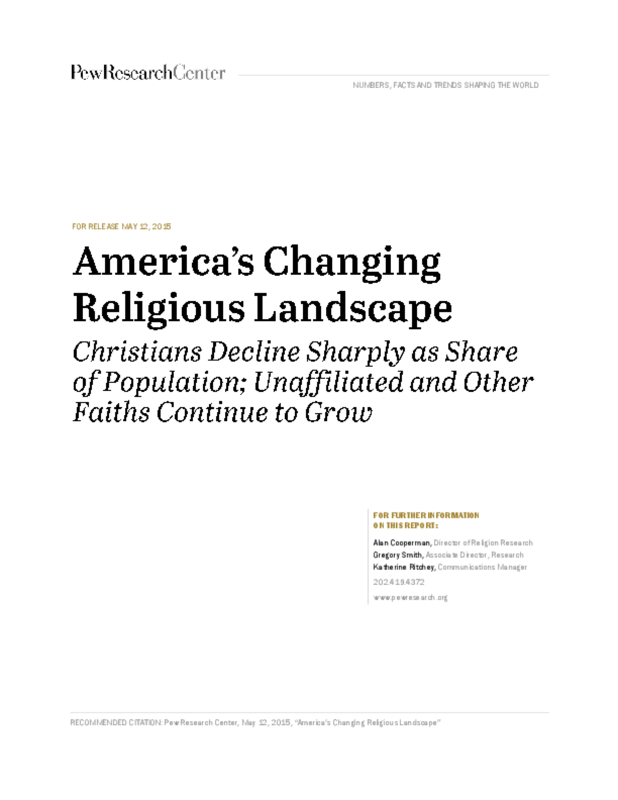 This report finds that the Christian share of the U.S. population is declining, while the number of U.S. adults who do not identify with any organized religion is growing. Moreover, these changes are taking place across the religious landscape, affecting all regions of the country and many demographic groups. While the drop in Christian affiliation is particularly pronounced among young adults, it is occurring among Americans of all ages. The same trends are seen among whites, blacks and Latinos; among both college graduates and adults with only a high school education; and among women as well as men.